In an election featuring several highly competitive ward races, few have the mood of a grudge match quite as distinctively as the latest show-down between Davenport councillor Cesar Palacio and Alejandra Bravo. The multi-lingual community activist first challenged Palacio in 2003 when the seat was open and he was running to replace his former boss, Betty Disero. That year, Palacio beat Bravo by just 720 votes. In 2006, Bravo ran again, this time in a nasty three-way contest that included businessman and Joe Pantalone ally Fred Dominelli. Palacio had campaigned hard against the St. Clair right-of-way, claiming it would wreck the street. While the Toronto Star revealed during that race that an anti-crime charity launched by Palacio paid the mortgage on a building where he had his constituency office, he hung on to the seat, this time by just 201 votes. Bravo, who has been working for the Maytree Foundation for several years, sat out 2010. 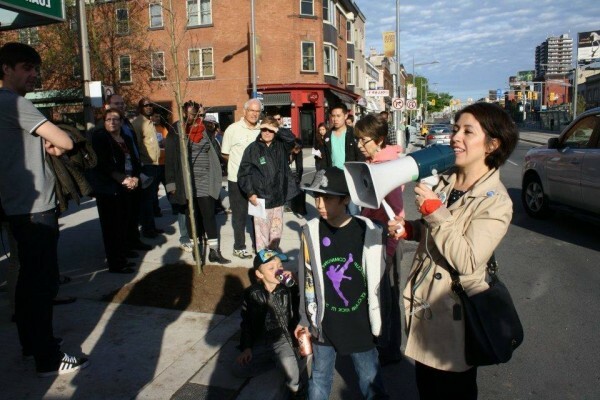 This spring, she embarked on a determined push to beat Palacio on October 27, focusing her campaign on the lack of community amenities in the ward. Hail the Mighty Cesar! Unafraid to take on the blue suits at the TTC and the apologists for the Toronto Public Library, Palacio has shown determination in working to expose some of the real fat at these city-funded agencies. Keep it up Cesar. Despite such full-throated endorsements, Palacio over the weekend decided to hire a prestigious law firm, Palaire Rolland, to smack Bravo with a preposterous defamation suit alleging that one of her canvassers has been distributing leaflets that mischaracterize his apparent determination to protect the City’s library system from the Atwood-hating barbarians from Etobicoke North. Bravo responded quickly, with a letter from a Sack Goldblatt Mitchell lawyer saying the canvasser had nothing to do with her campaign and that the accusation in any event amounts to little more than a SLAPP suit. A bit of context is helpful. In January, 2011, just weeks into Ford’s first year, the Toronto Public Library Board balked at requests to close the urban affairs branch and reduce its acquisitions outlay, and instead approved a compromise budget that would have prevented closures and featured a modest spending hike. Palacio, as a council member on the TPL board, voted against the compromise. That first Ford budget was the easy one, however. As the brothers Ford aimed for steep cuts for the 2012 budget through the “core services review,” the public backlash against library cuts and other services began to mount. A CUPE-funded poll conducted in July, 2011, found that 71 to 78% of residents of wards whose councillors sat on the TPL Board opposed closures. Over the summer, those results — and the rising tide of voices in defense of the library system, including the emotional late-night deputation by 14-year-old Anika Tabovaradan — began to yield results. By September, 2011, a massive 13,000 respondent Forum poll, published by the Toronto Star and paid for by CUPE 79, found that a whopping 81.2% of Palacio’s residents opposed sweeping budget cuts, including library closures. Come year end, Palacio’s library pivot was almost complete: as the defamation letter points out (without acknowledging any of the background above), the Globe and Mail in December reported that Palacio had joined with seven other TPL Board members to reject a Ford-supported motion by chair Paul Ainslie to slash hours in 56 branches in order to cut over $5 million from the budget. Oddly, the lawyer’s letter includes the roll call vote on a motion by Raymond Cho — tabled during that epic January, 2012, debate on the operating budget — to reject the executive committee’s requested library budget cut and instead provide the TPL with a $3.89 million draw from the so-called tax stabilization fund. Palacio, a member of Ford’s executive committee, voted against that measure (he was on the losing side of a very tight vote). The point is that while Palacio was part of a group of Ford-allied councillors who tried to blunt the cuts to popular services like the library in response to wide-spread public opposition, he clearly sided with the mayor on other key library votes that led to reductions in service. Actions speak louder, etc. But surely the strangest thing about this lawsuit — besides the fact that political speech, accurate or not, enjoys broad protection under Section 2 of the Charter of Rights and Freedoms — is that it appears Palacio is trying to distance himself from a mayor who counted him as one of his most reliable backers. After all, if he’s going to such lengths to disavow Ford’s gravy train rhetoric, Palacio must surely be worried that anti-Ford sentiment has settled over the immigrant-heavy neighbourhoods of Davenport, one of Toronto’s most diverse wards. Indeed, more than anything else I’ve seen so far, this desperate gambit suggests that Bravo, in her third bid to win Davenport, may be poised to finally close the book on Cesar Palacio’s controversial tenure as the councilor for Ward 17.
wonder if this will be the tipping point to put bravo ahead of selvam, everyone in ward 17 wants palacio out, but not sure which horse to back to avoid splitting vote. We’re focusing on resolving concerns as we’ve done since January and I’m sorry to see this play out again in Davenport.